Synthetoceras Skull. Synthetoceras tricornatus. With horns. No Mandible. Early Miocene to Late Pliocene. Polyurethane cast of an original University of California Berkeley fossil specimen. 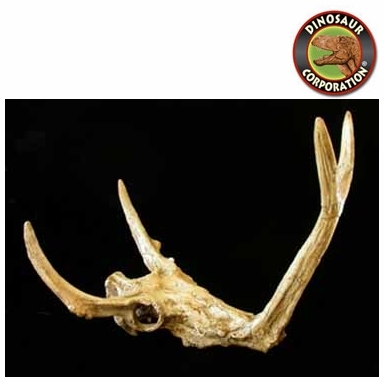 Synthetoceras tricornatus is a large, extinct protocertid artiodactyl, endemic to North America from the Miocene epoch, 13.6�5.33 Ma, existing for approximately 8.27 million years. With a length of 2 m (6 ft 8 in), Synthetoceras was the largest member of its family. It was also the last, and had what is considered to be the protoceratids' strangest set of horns.